Earn points for your purchases and make a rewarding experience take flight. Start your journey with a boost. 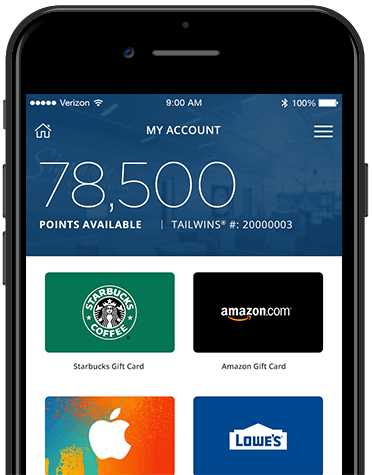 Sign up and immediately start collecting and redeeming Signature TailWins® points. Redemption is a click away. Put your points to work as a reloadable cash card, or choose from a several gift card options to bring your points home. Earn more points more ways. Take part in innovative new promotions and sweepstakes to increase the uplift into your Signature TailWins® account.